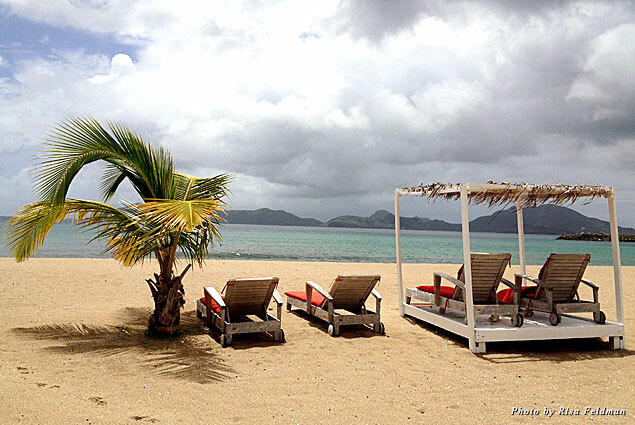 When you really need to get away from it all, the island of Nevis in the West Indies should be at the top of your list. 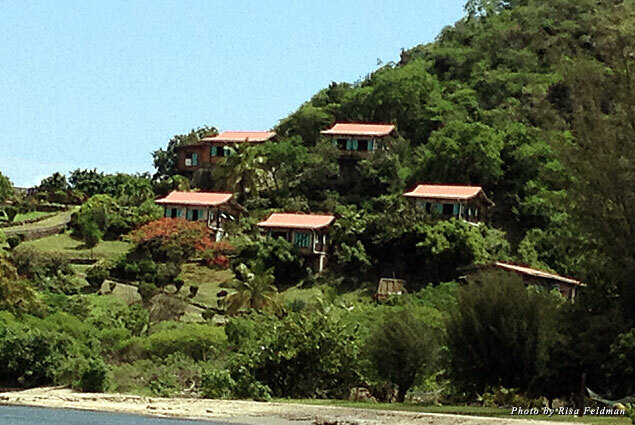 I was there to experience different styles of accommodations the rustic Caribbean island offers. A few had some unique elements or distinctive touches that made them special. 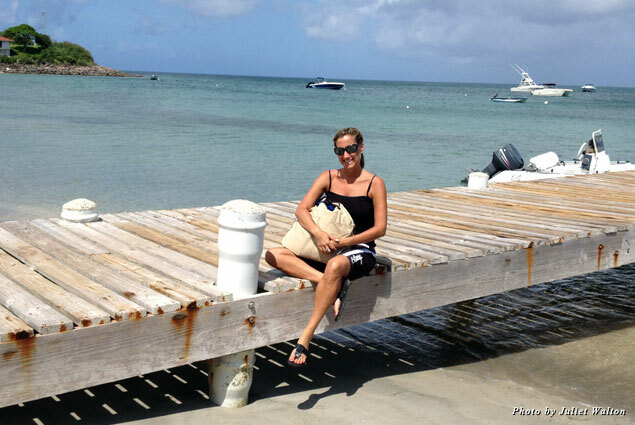 The experience began by flying into St. Kitts, which is a three-hour flight from Miami. 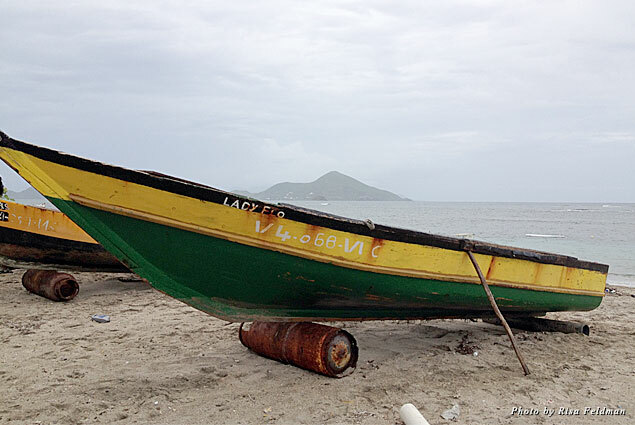 After a 20-minute drive on unpaved, bumpy roads and a 15-minute water taxi, I arrived in Nevis. My heart began to sink as my driver traveled farther and farther away from the crystal-clear water. It was apparent I was not going to be staying anywhere oceanfront, which is ALWAYS my first choice. As he started the ascent up a winding hill, I had to laugh out loud as about a dozen monkeys blocked our way by playing in the street. They finally jumped up into the mango trees above to let us pass, and that’s when I saw the first location where I would be staying. My first thought, as kooky as it may sound, when I saw the reception cottage at The Hermitage was, what a great place for fairies or a hobbit to live. The place had the appearance of a miniature gingerbread house. As I was escorted to my cottage I looked around and saw a few of the other 15 guest cottages scattered throughout the garden grounds. The surroundings give the feeling of being in an enchanted village, almost lost in time, as you are tucked away in a rainforest on the side of the mountain. My cottage was simple, an understated living room and a cute outdoor sitting room. My bedroom was incredibly romantic looking, with a four-post canopy bed surrounded by white netting and fresh flowers placed both on the bedside table and lain upon the pillow. It was like stepping into a romance novel. I realized I had stopped yearning for an oceanfront room; this property offered me a secluded, charming mountain experience and became the perfect spot for my writing. The Hermitage’s main house is where the bar is located and where all the outdoor dining takes place. It is decorated with antiques and offers peacefulness with a sense of calm that comes from more than 350 years of history. 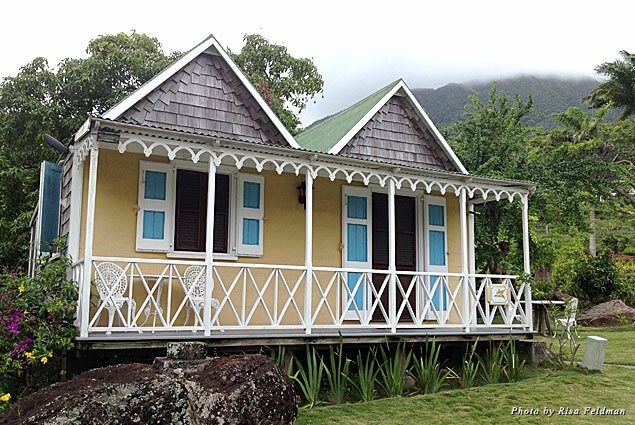 The Lupinaccis, who own the plantation inn, are keen fans of traditional St. Kitts and Nevis vernacular architecture, and some of the cottages on-site were actually moved from other locations in Nevis and restored at Hermitage. You will find Richie Lupinacci—who has taken over running the charming Nevis property from his parents—walking around the grounds or joining guests in the Great Room, offering a killer rum punch (the best I’ve had), and sharing stories about the island and the history of Hermitage. His warmth and hospitality are authentic and make for an extra special stay. Rates at the Hermitage range from $150 to $850 per night based on type of cottage and season. The Montpelier Plantation and Beach Hotel, part of the Relais & Châteaux collection, has 15 beautifully decorated private cottages on property. Its ecological policy is top notch and includes growing its own organic herbs, having restaurant remains saved and collected by local farmers to feed their animals, and having two cisterns to collect rainwater to use in the laundry and the gardens. 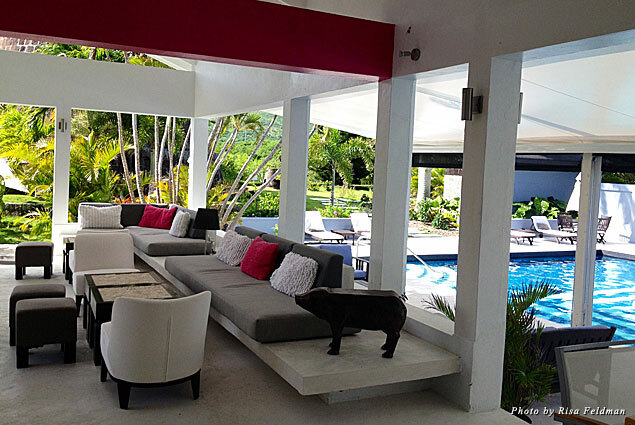 The pool area is very chic, with couches in gray and pink hues sitting above the lounge chairs. 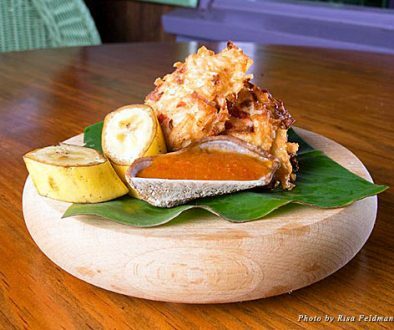 The hotel is especially known for the incredible dining experience it offers. 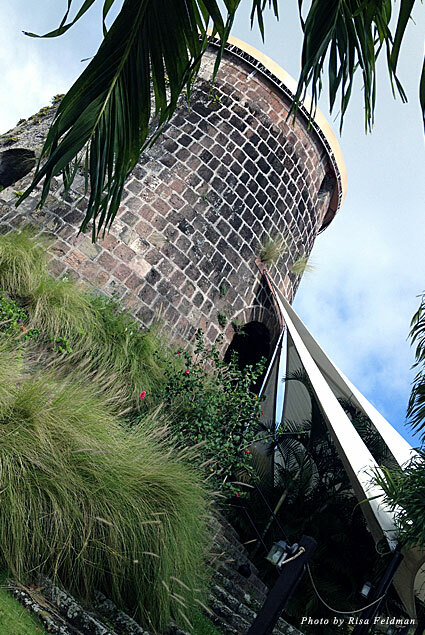 The intimate, candle-lit Mill Privée is a 300-year-old sugar mill converted into the only restaurant of its kind in the world. The original mill is completely intact, and the well trodden floor and hand-cut round stonewall is spectacularly atmospheric. Rates at the Montpelier Plantation and Beach Hotel range from $200 to $1245 per night depending on type of cottage and season. My breath was literally taken away as we approached a property named Goldenrock Inn. The hotel was bought and restored through the eyes and talents of artists Helen and Brice Marden. The stone steps leading up to the main landing elicit a grand feeling, and the usage of stone is continued throughout the property, met with accents of red furnishings. The bar area and indoor common space sit within a stone castle setting and are very eclectic in their décor. The 11 guest cottages offer extreme privacy with spectacular sea views toward the Caribbean islands of Antigua, Redonda, and Montserrat. Guests can wander through the many paths of the tropical gardens or plunge into the freshwater pool. Goldenrock Inn is an escape—a place to relax and be inspired. Rates at Goldenrock Inn range from $180 to $395 per night depending on type of cottage and season. After the three mountain hotels it was time to head down and experience a few oceanfront properties. 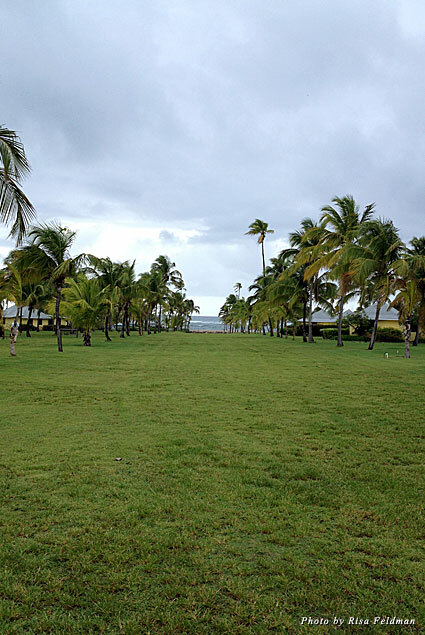 Nisbet Plantation Beach Club is set on 30 acres of land. 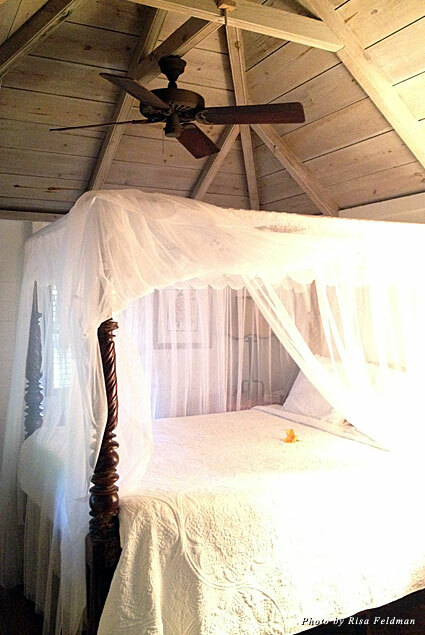 Intimate and relaxing, it is the Caribbean’s only historical plantation inn on the beach. Thirty-six lemon-hued cottages, all with traditional Nevisian white pyramid roofs, are spread out over a huge lawn on the palm-filled property. The elegant yet casual cottages offer a mix of old world charm with modern-day conveniences. The private beach offers amenities including a beach bar and dining area and pool that sits above the ocean. Whether having high tea in the historical main house living room or a tropical drink in a hammock, the tranquility and service this property offers is what makes it such a memorable stay. Rates at Nisbet Plantation Beach Club range from $399 to $1082 per night depending on type of cottage and season. 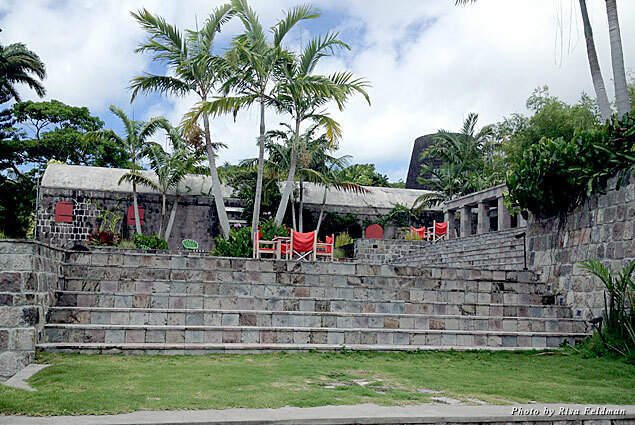 If you want to try something different from a hotel or cottage, then Zenith Nevis is for you. Zenith is a new, luxurious, modernized beachfront home. 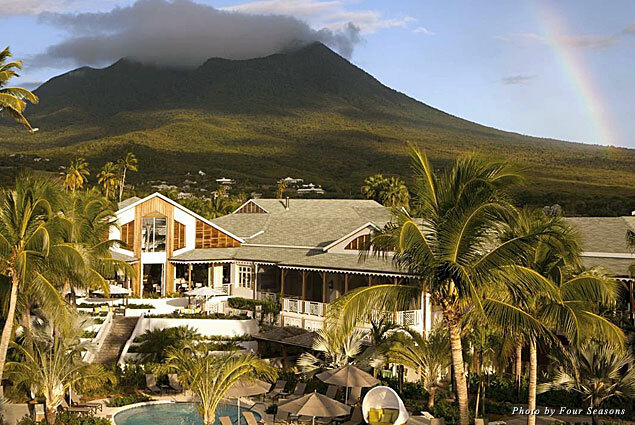 It is nestled in a quiet cove with stunning views of the rugged St. Kitts peninsula and rainforest-clad Nevis peak. The house is stylishly elegant, fit for a cosmopolitan clientele desiring the ultimate in pampered service. Zenith is the first of 30 homes being built to offer full sale and fractional ownership opportunities. 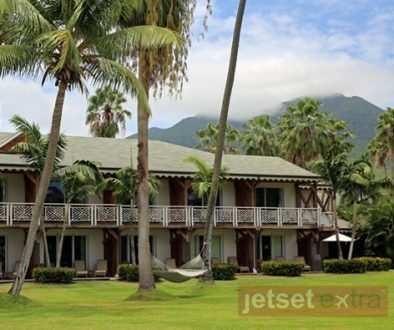 Rates at Zenith Nevis range from $400 to $1500 per night for a rental and $1.8 million for a purchase/$400,000 per fractional. Last but surely not least, for the traveler who prefers to stay at a property that has an outstanding reputation worldwide, the Four Seasons is for you and will continue to impress. Whether you choose to stay in a luxurious room, fabulous villa, or one of the incredible Four Seasons estates, all offer the luxury that goes along with the Four Seasons name. The property hosts the only golf course on the island, as well as a luxury spa, tennis courts, water activities, children’s programs, and a variety of restaurants. Rates at the Four Seasons vary depending on season and type of room/villa. 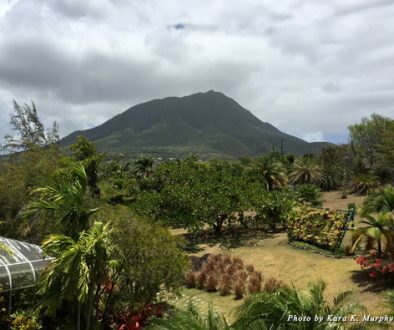 No matter where you stay in Nevis you are bound to fall in love with this rustic island on which old Caribbean charm still exists.